Heat oven to 350°F. In medium bowl, mix flour, 1/4 cup sugar and 1 tablespoon lemon peel. Cut in butter, using pastry blender (or pulling 2 table knives through ingredients in opposite directions), until mixture looks like coarse crumbs. Set aside. In 2-quart saucepan, mix 3/4 cup sugar and the cornstarch. Gradually stir in water. Cook and stir over medium heat about 10 minutes or until thickened. Add 1 1/2 cups of the blueberries. Reduce heat to low. Cover; cook about 10 minutes or until mixture returns to a boil. Stir in 1 teaspoon lemon peel and 1 tablespoon lemon juice. Add remaining blueberries; stir gently. Set aside. In small bowl, beat cream cheese filling ingredients until smooth; set aside. Separate dough into 8 biscuits. Split each biscuit in half to make 16 rounds. With floured fingers, flatten each to form 4-inch round. Press 1 biscuit round into each of 16 ungreased regular-size muffin cups. 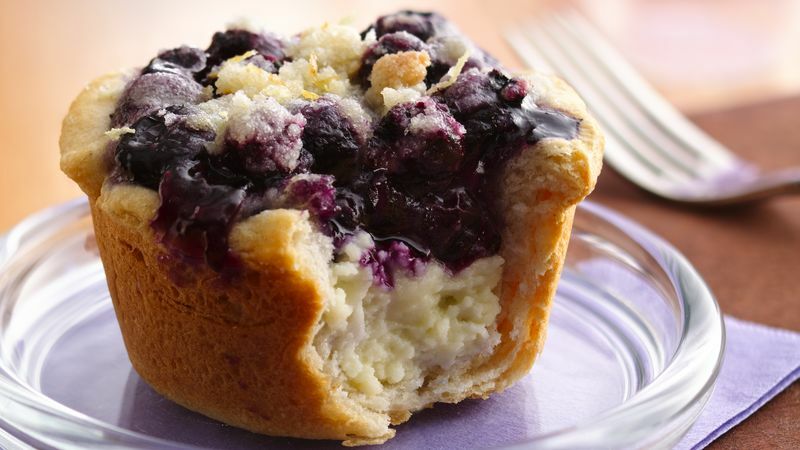 Spoon 1 tablespoon cream cheese filling and 2 tablespoons blueberry filling into each biscuit-lined cup. Sprinkle each with about 1 tablespoon streusel (cups will be full). Bake 18 to 22 minutes or until golden brown. Cool 5 minutes. Remove from muffin cups to cooling rack. Cool 10 minutes before serving.